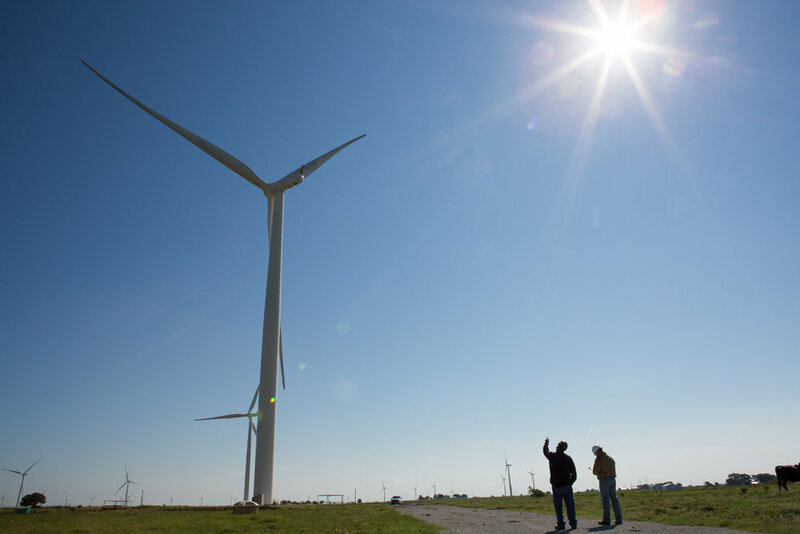 At the Tyler Bluff Wind Facility in Muenster, Texas, Steve Lund (left), Site Manager for Siemens, and Robert Detweiler (right), Tyler Bluff Project Manager, examine a wind turbine. Steve Lund, Site Manager for Siemens, climbs a staircase at the base of a wind turbine, which is mounted on top of an 80-meter tall tower. 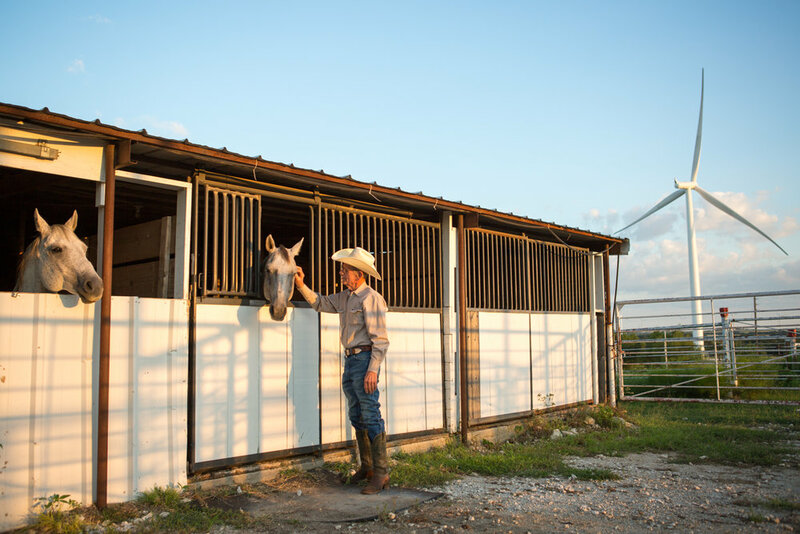 Charles Barfknecht, a saddle maker and land owner in Muenster, Texas, interacts with his horses on his property. 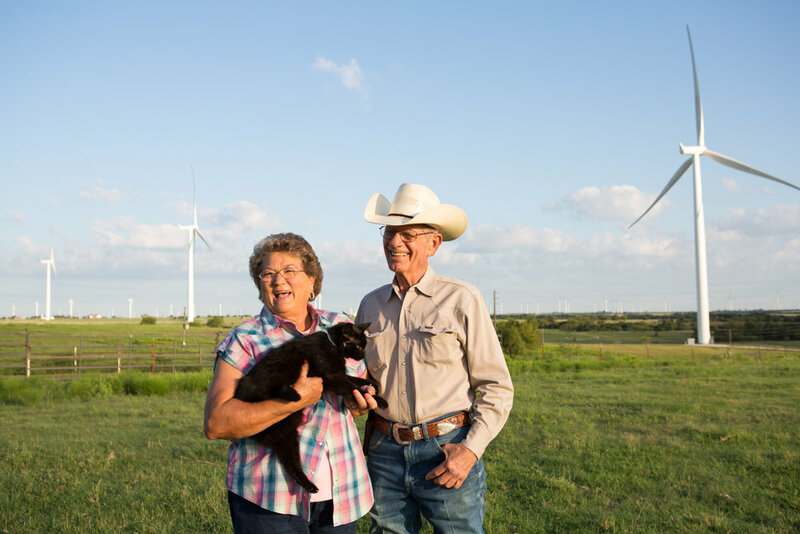 Charles leased some of his land to the Tyler Bluff Wind Facility and receives lease payments from the wind turbine on his property. 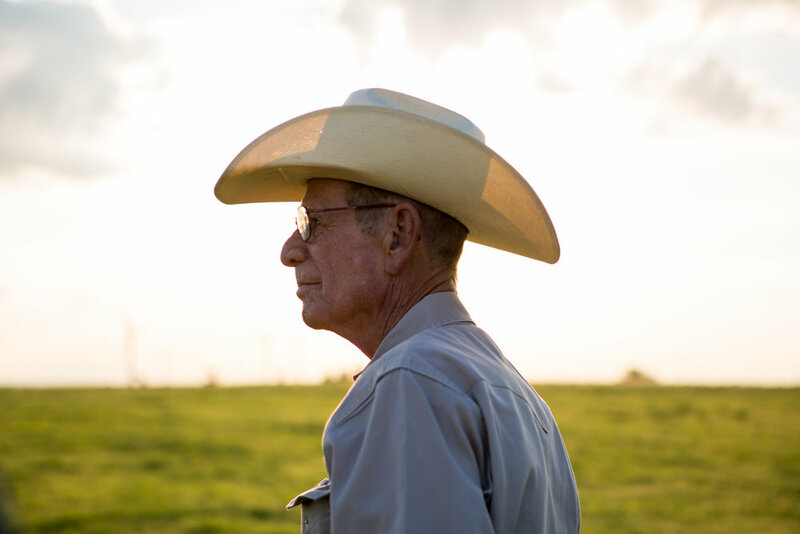 Charles Barfknecht poses for a portrait in his property's pasture in Muenster, Texas. He thinks of the lease payments as social security. Charles and his wife, Jane, prepare to ride their horses on their property. They understand that there is an environmental green movement in the country. Charles often reflects, "We contribute to the green movement and get some green for it." With several wind turbines as a backdrop, Charles and Jane, who compete in horse square dancing, practice riding in the property's pasture. Charles and Jane pose for a portrait with their cat Stinky in their property's pasture. At dusk under moonlight, several wind turbines fill the landscape at Tyler Bluff Wind Facility in Muenster, Texas. Tyler Bluff Wind Farm in Muenster, Texas, consists of 52 wind turbines manufactured by Siemens, which combined generate approximately 126 Megawatts of power. Tax revenue from the project provides financial support to local social services and individuals in the area - two such people are Charles and Jane Barfknecht. Charles and Jane lease some of their property to the facility and receive quarterly payments that help with everyday needs.